The Name of Jesus Ministries (TNJM) was founded by renowned author, conference teacher and bible teacher Rev. Dr John Idowu. For more than 25 years, TNJM has been faithful to providing simple, practical teaching and understanding of the Bible. Since her inauguration in 1988, she has remained focused on her mandate of “teaching believers how to walk in truth, power and wisdom of God through the thorough and consistent teaching of God’s word” and this simple approach has caused the ministry to experience phenomenal growth and global success. In the year 1987, while Rev. Dr John Idowu was rounding up his PhD research, he decided to seek the face of the lord as to know the mind of God for his life. It was during his prayer time that he received the vision of the name of Jesus ministries. The lord told him that he would be sending him to an unknown land so that through that, His name will be glorified. He received from the Lord that he would be pioneering a fresh work for the King there and then he heard himself prophesying these words aloud “And it shall be called the name of Jesus ministries”, and that was where the name of the ministry was gotten. With passion for soul birthed out of this experience, he committed himself to full time ministry. Due to his diligence and commitment to God, he began a local assembly as commissioned by God. 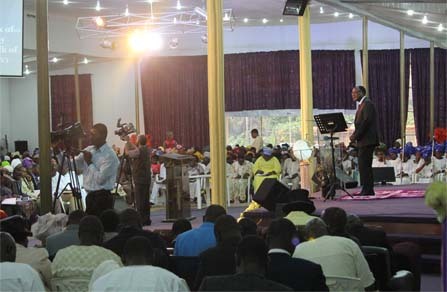 The first service of the Name of Jesus Ministries was held on 8 May, 1988 in a kiosk at Ado Ekiti and the ministry has since then continued to grow at a rapid pace. He started ministering on the wonderful name of Jesus until a woman with a prolonged issue of blood came to the church and was overwhelmed by the power of God and was instantly healed. The lord spoke to him and said “my son, learn more to preach in my name, there are many more things in the name that you don’t know yet”. He has since then consistently taught on the power in the NAME. The name of Jesus Ministries has a passion for seeing people excel in every area of their lives, teaching the Bible with simplicity and making sure that people understand the truth of God’s word. The ministry broadcast outreach has been a joy to many homes. The ministry has made tremendous impact through bible teaching meetings, conventions, conferences, charity acts, book publications, television and radio broadcasts and music production, and continues to spread the good news via the distribution of her teachings through the internet, compact disks, audiotapes and video tapes. The borders of Nigeria do not restrict the impact of the ministry as she continues to teach believers how to walk in truth, power and wisdom of God.